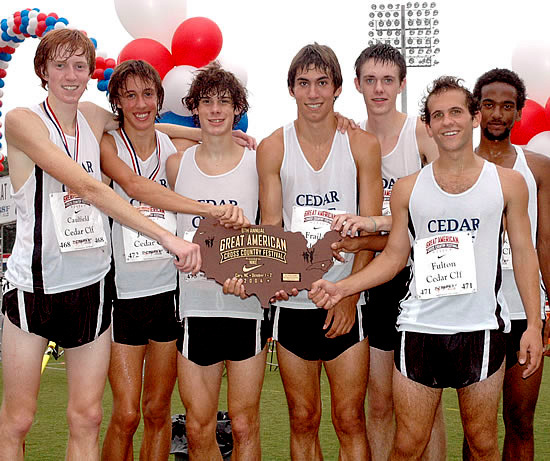 The US#10 Cedar Cliff Colts won the Race of Champions today at the Great American Cross Country Festival in North Carolina, knocking off US#6 Mountain View UT, which was 3rd. 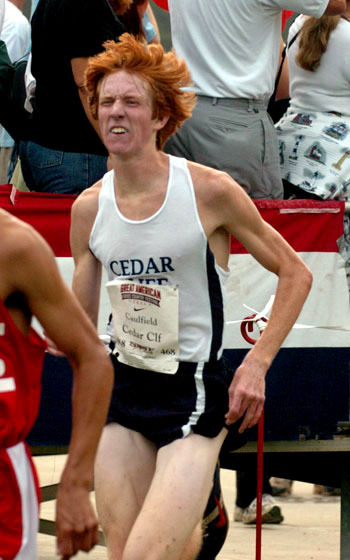 Colt's #1 man Pat Caulfield was 14th in (photo by John Dye). In the same race, Sam Luff of Emmaus took 5th in 15:39. In the girls ROC, St. Basil took 5th, while Cedar Cliff was 8th. Running as an individual. Unionville's Katie Thaeder was 27th. Cedar Cliff #1 Janelle Young took 21st, while Basil's Lynn Morelli was 24th. In the Seeded Invitational, West Chester Henderson's girls were 2nd, with Megan Durkee 8th overall. Tamaqua's Alexa Griffiths was 6th in the race. In the Seeded Boys, Henderson took 8th. And in the Small School races, LaSalle took first in a mini-PCL showdown against Archbishop Carroll, who was 2nd. LaSalle's Sean McGinley took 2nd overall in 16:05. In the Girls Small Schools race, Archbishop Carroll took 6th. "Take the downhills hard and survive the uphills" helps Cedar Cliff win the Great American ROC"
Cedar Cliff's Pat Caulfield was 14th in the ROC (Photo by John Dye). Cedar Cliff presents their ROC champions trophy. (Photo by Donna Dye). West Chester Henderson took 2nd in the Seeded Invitational (Photo by Donna Dye).